There are often posts on the internet where babies are shown sleeping in a similar fashion as their fathers and we all go goo goo gaga over it. Well it was those post that inspired this awesome idea for a gallery in our intelligent minds you see. They say that the father genetically dominates the child and although a lot of mothers will strictly disagree, we have a bundle of images to prove that sons (not necessarily daughters, accepted) will follow in their fathers foot steps more often than not, if the father does not abandon the little guy that is. As a child all we really want is to be like dad. Dad's are suppose to provide a great example in life. However, not only do kids want to be like dad but dad's also want their kids to grow up and be like them. It's why some men have kids, to have little mini-me's running around and to share in life's adventures. Here are some photos of fathers taking that theory to the next level. How adorable is this little guy! His matching motor cycle and outfit is just like his dad’s. This cute photo shows how fathers and sons can bond. 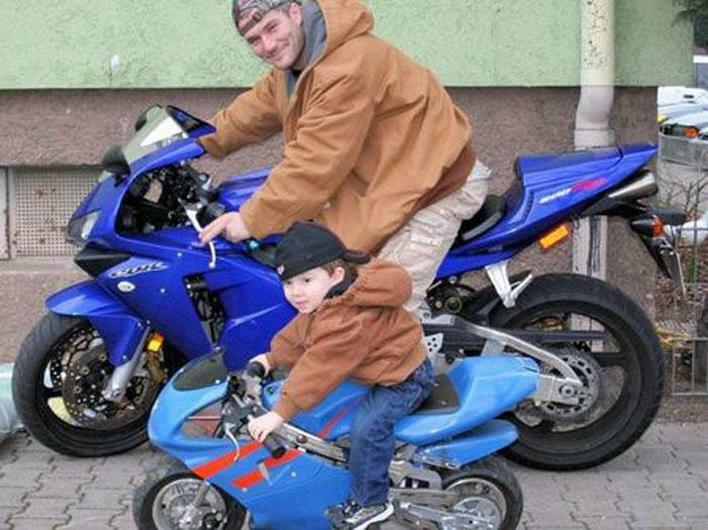 Let’s hope that he grows up to be as cool as his dad in this photo.